Peter Hilborn submitted this photo and caption. This is a photo from last summer of Revolution's pit. 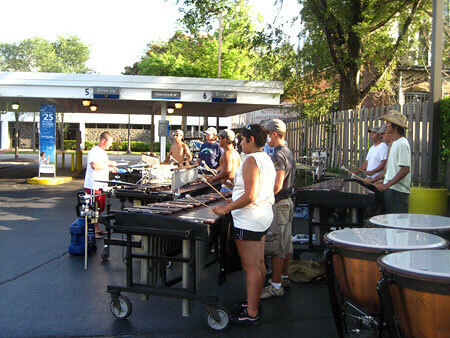 A big part of getting through a summer in a drum corps is rolling with the punches – being able to be flexible mentally, musically, physically and ready for whatever the tour will throw at you. Here we had to improvise for some rehearsal space, holding a music block in a Chase bank drive through – when the bank was closed of course!